Slax is a LiveCD Linux distribution based on Slackware and is currently being developed by Tomáš Matějíček. Packages can be selected in a website where users can build a custom Slax iso image. Slax slogan refers to the software as a "Pocket Operating System". The latest version of Slax is 6.1.2, which was released on 4 August 2009. The developer has stated that work on Slax 7 will begin once a stable kernel (version 2.6.34) is released with LZMA support for squashFS. One of the main benefits of the Slax distribution is its ease of customization. Additional software can be added and removed, using Slackware packages and Slax modules. A traditional package manager such as Debian's APT is not required to load additional software; Slax modules are completely self-contained. Users can also modify the default CD image or USB drive installation to customize the packages available in the distribution on boot. Slax also allows Slackware packages to be converted to Slax modules with the tgz2lzm command. The Slax homepage offers a software repository for downloading user created modules and uploading new ones. The stackable file system of choice changed between Slax versions 5 (UnionFS) and 6 (aufs), as did the module file name extension (changed from .mo to .lzm). The Slax releases before Slax 3 were known as "Slackware-Live". Slax Standard was the standard edition for normal personal use. Slax KillBill included Wine, DOSBox and QEMU to run DOS and Microsoft Windows applications. Slax Server supplied additional Internet functionality and came with pre-configured DNS, DHCP, Samba, HTTP, FTP, MySQL, SMTP, POP3, IMAP and SSH servers and several other server applications. Slax Popcorn was a minimalistic edition focused on browsing and multimedia playback. 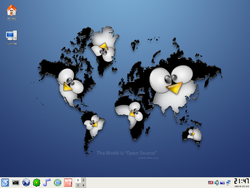 It featured Mozilla Firefox as the default web browser and the lightweight Xfce as a desktop environment instead of KDE. Slax Frodo was a "bare bones" edition, providing only a full-featured text-only environment, particularly focused on computers with small amounts of RAM. The Fluxbox Window Manager was an option in all editions except Frodo. Slax 6 is offered in a single version, and completely relies on modules (additional packages) for extra features. From version 6, modules are based on LZMA compression, but some compatibility was initially provided between the obsolete .mo modules used by Slax version 5 and the more recent .lzm modules of version 6. As there have been some changes between Linux kernel versions during sub-version releases of Slax 6, however, the .mo modules of Slax 5 are now considered obsolete. Each module or package should be compiled for compatibility with the Linux kernel currently in use.